Just when you think things couldn't get any better after a superb display against West Brom, things get taken up another level with a fantastic performance and incredible result. 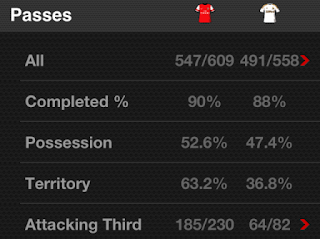 Swansea had more attempts overall but the top line figures don't do justice to the comparative quality of the chances. Where Arsenal were largely restricted to speculative shots outside the box, there were a number of opportunities for Swansea where a player was clean through against Szczesny. 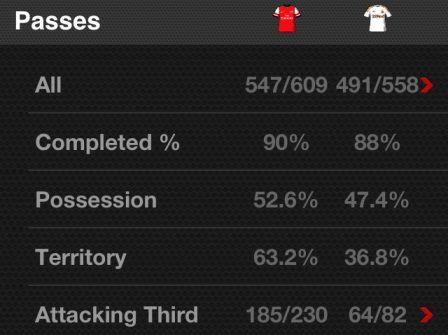 Looking at the overall pass stats, the biggest difference between the two teams is the Territory figure, it's true that an lot of the play (especially between the 46th-75th minute marks) was deep in Swansea territory but very little was created by Arsenal and allowed plenty of space for Swansea to create far better opportunities on the counter-attack. Closely linked to the Territory stat, the final third passing was far higher by Arsenal, but achieved little of note with the majority of it focused wide of the penalty area causing little trouble. It was notable that when Arsenal had a free kick in a relatively dangerous position late on they decided to take a quick short free kick which meant they quickly returned to the same sort of possession that brought little joy the rest of the game. Cazorla was the only Arsenal player to have more than one attempt (having 5 of Arsenal's 10) and also attempted twice as many take-ons as any other player (although this was from twice as many attempts as anybody else). Cazorla's 4 successfull take-ons tended to be in areas of greater space, with attempts closer to goal being unsuccessful Of his attempts at goal arguably only 1 was a really good opportunity. It was also interesting to see (especially early on) Arsenal looking to press the Swansea defence with Tremmel having to make far more long clearances than usual. After the match much was made by Wenger of Arsenal players being 'tired', watching the match it seemed that if there was any tiredness it was more mental than physical as there seemed to be a real lack of any pace to their passing. Despite Swansea's goals coming from counter-attacks late in the game this was certainly not a smash and grab, Swansea created the better opportunities and passed the ball with more purpose. In what was a superb team performance it is difficult to highlight individuals although Rangel in particular was fantastic and Mr Consistent Leon Britton put in another controlling performance and Michu's two finishes were taken expertly and with supreme confidence.